It means so much – collection…collection of art; collection of antiquities; collection of museums; collection of philanthropic causes; marks made on the world; lives well-lived. 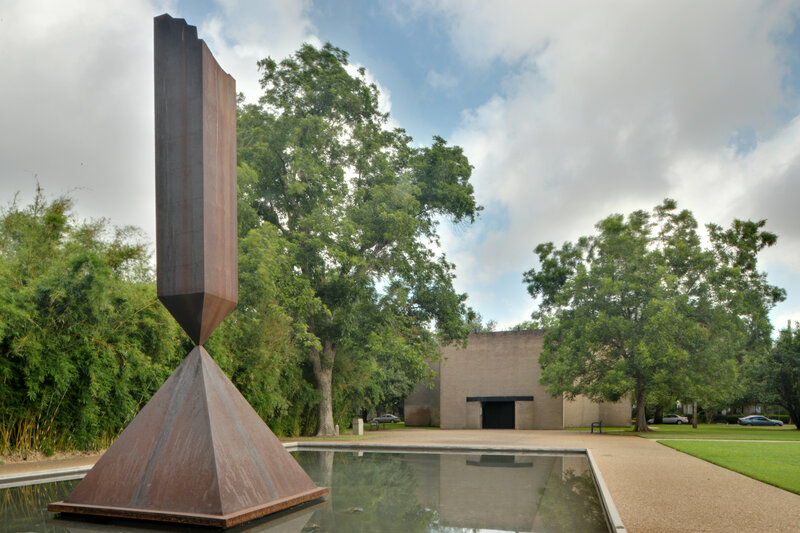 John and Dominique de Menil were key figures responsible for propelling Houston to the top of the list of truly great art cities. They developed the art department at the University of St. Thomas and later the Institute for the Arts at Rice University. They had a long and storied history of support to the Contemporary Arts Museum Houston and the Museum of Fine Arts Houston, to which they brought major exhibitions and gave important works. They engaged architects from around the world to bring the first modernist, international style buildings to the state. They amassed a collection of more than 17,000 pieces of art: paintings, sculptures, decorative objects, prints, drawings, photographs and rare books. The museum campus opened in 1987 with later buildings opening in the 90’s which house the Cy Twombly Gallery, the Dan Flavin Installation at Richmond Hall, the Bysantine Fresco Chapel. 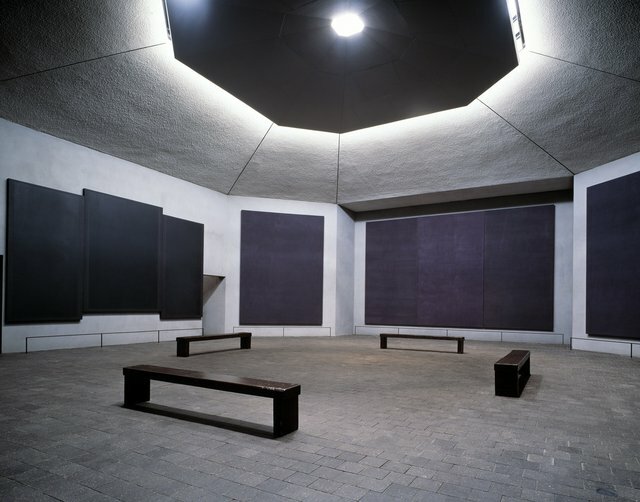 The Rothko Chapel (ca. 1971), the Loretto Park with Tony Smith and Mark di Suvero sculptures and the network of offices housed in bungalows and walkways tucked throughout the neighborhood complete the campus. Last month, we got the chance to spend a nearly perfect day walking around the Menil Collection. What a suprise! We started at the Rothko Chapel, fully prepared to wait with the crowds that would surely be lined around the block. Instead, we parked at the entrance, we walked though the garden to view Barnett Newman’s “Broken Obelisk” standing in the reflection pool out front and then we walked in. I must admit I had brief concerns that we might be trespassing – “6 million people in Houston must know that you are not supposed to actually go the Rothko Chapel, right?” After I was convinced that it was open and we should check it out, we did.. and we loved it. The austere space is an octagonal room constructed of brick and covered in gray stucco and capped with a baffled skylight. It is tranquil – actually , National Geographic Society named it “One of the world’s most peaceful and powerful destinations.” On the walls are 14 site-specific canvases painted by Mark Rothko. At first glance, they look like windows – a series of big blank black canvases. We walked around the room, looking at the canvases from different angles and taking in the effect of each from across the room. Then we moved in closer. We walked up to a canvas until we reached that point at which the painting completely filled our fields of vision. I expected to realize some sort of calming meditative state – you know, staring into an abyss. What happed was amazing! It was the most unusual experience: the clouds outside passed over the skylight and it was as if the canvas came to life. We had been patient and open to what the works had to offer and, in turn they began to breathe…slowly at first “did you see that?” and then with a steadiness that allowed us to see the colors and strokes and patterns. We saw the purples and reds, the horizontal and vertical lines, compositions on display that had been mostly overlooked. We began to move from canvas to canvas, slowly and then more quickly as the paintings gave us the keys to unlock their treasures. I have to tell you, I probably could have ended the day at this point and been fully satisfied with our discovery – but that is just not me; I almost always have to keep going. I am compulsive when it comes to looking at art and knowing one of the world’s great collections was just a block away…of course, we checked it out. We walked through the Montrose neighborhood of modest little bungalows; down tree-lined streets and little gardens and walkways and then Loretto Park with Tony Smith and Jim Love sculptures up to the museum. 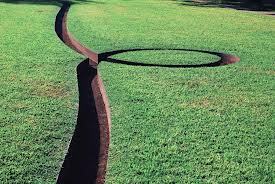 We crossed over Michael Heizer’s negative spaces, rifts in the lawn and into the main pavillion. I was delighted to be greeted with Yves Klein’s luscious blue paintings – I think I have said it in previous posts, but his paintings make me feel like I could just dive right into that pure saturated color. We toured the main museum building and were impressed with the collections. We saw the Claes Oldenberg “Strange Eggs”; we checked out the galleries of works by Ernst, Johns, Léger, Martin, Matisse, Picasso,Raushcenberg,Tanguy, Warhol. We saw indigenous art from Africa and the Pacific Islands; we got to see the Cycladic and Greco-Roman collections. We kept it moving though – there was even more to see. We walked outside the main building and continued through the campus, ducking between bungalows to find Richmond Hall, an old neighborhood grocery turned dance hall. Dominique de Menil acquired it in the 80’s and had since converted the space to house site-specific light installations by Dan Flavin. It’s truly like stepping into another world: the grey concrete space is lined on either side with flourescent sequences of yellow, green, blue and red…vertical columns, one after another after another repeating through the entire space. It was pure joy. Finally, we made our way to the Cy Twombly Gallery. He is one of my favorite artists (I know, I know I have a lot of them) – coincidentally, I went to school in his hometown of Lexington, VA. His work is hard to categorize – not exactly AbEx, not quite Minimalism not Pop, but all of those. If you explore his seemingly crazy, energetic scribbles, you find traces of poetry – references to history and mythology and always scrict adherence to composition. The marks are set, then erased and then brought back. The colors melt like the fading of memories of stories being told. 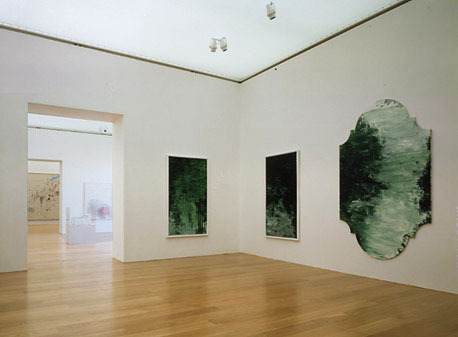 This time around, my favorites were the green paintings. The gallery is a gorgeous, light-filled space (again baffled skylights) that avails itself from one space to the next. The design of the space combines with the work, much like the other buildings on the Menil campus. The effect thoughout the collection is to elevate the experience and to interact with the artwork. For me, it made me look at artwork that I thought should be familiar and consider the power of context. This entry was posted in Art, Art Collecting, Contemporary Art, Uncategorized and tagged art, art by Mike McClung, art collecting, art consulting, ArtLook, Contemporary Art, Cy Twombly Gallery, Dan Flavin, Denver Art Consultant, individual art consulting, Menil Collection, Mike McClung, Mike McClung art, my artlook, residential art consulting, Rothko Chapel by mlmcclung. Bookmark the permalink.